Developed by Bytro Labs UG for internet browsers, Supremacy 1914 is a free to play, real time strategy MMORPG for internet browsers where players become head of a mighty nations in precarious Europe after the turn of the century. They face the challenge to become the undisputed sovereign leaders of the whole continent using smart diplomacy or simply the brute force of his glorious armies. With a sophisticated AI, Supremacy ensures fun even in rounds with less than 30 participants. The duration of one round varies between four to eight weeks. You play on a map where units move continuously instead of being listed in tables, like in most browser games. 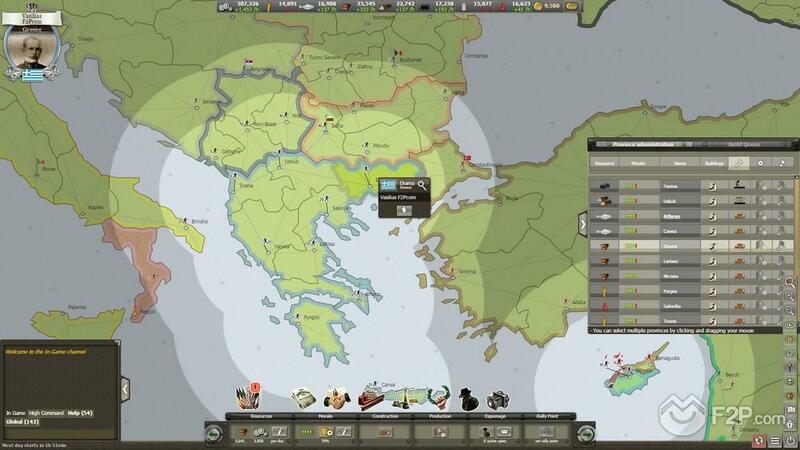 It features 30 playable nations and intelligent computer-controlled opponents, units move in real-time on a historic map, extensive province upgrading, resource trading, and diplomacy, unique spy features and a ranking system. With Goldmark you can use special features in the game that are not available without the use of Goldmark. Goldmark are the Premium currency in Supremacy 1914. With them you can very successfully play Supremacy 1914 without using Goldmark, but the systematic use of Goldmark can give you the crucial advantage that can lead you to victory. For example, if you hover your mouse over a city whose morale is lower than 100%, you have the possibility to start a Propaganda Campaign. It will raise the morale by 5% for 500 GM. If you have a factory in one of your cities, you can reduce the time for any ongoing production by 12 hours for 1,000 GM, or if you spend 5,000 GM you can either create a gold round or join an already existing one.